Late last year I ran a series of workshops for newly arrived and refugee women in Birmingham for Craftspace & CIP (Community Integration Partnerships) on a project aimed at starting up a craft-based social enterprise, which is explained here. I wanted to develop a project around hand sewing, with each person who came to the workshops contributing to a large finished piece, with the idea that this would be a metaphor for us working together to integrate and support refugee and newly arrived women. It was almost inevitable that I wanted to work with Suffolk puffs, as I love them so much. I wanted to use the idea of working together on a quilt, with all the associations of community, nurturing and women working together. I also wanted to try out some new ideas, using Suffolk puffs in more conceptual ways, by incorporating personal stories into the individual Suffolk puffs. The fabrics I chose were re-used clothes, bedlinen and curtains, all with a history of their own. The centre of each puff is filled with a digital transfer printed photo of foodstuffs from around the world, taken in my local market; plantains, chillies, guavas, herbs etc. 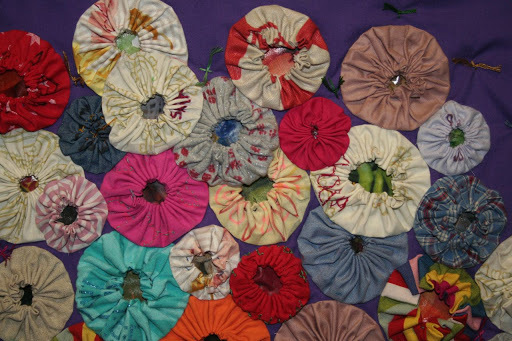 Each woman who made a puff chose a foodstuff she identified with and printed a circle into the centre of her chosen fabric. 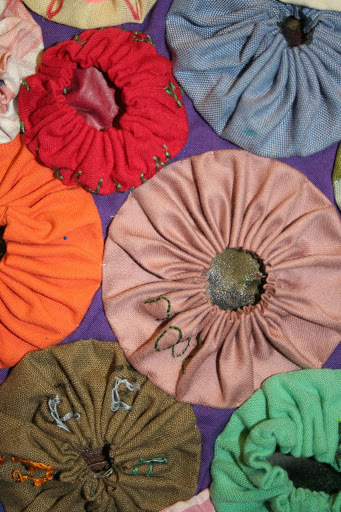 I also encouraged incorporating words or symbols of meaning into the Suffolk puffs, by writing and / or embroidering the words into the fabric of the puff. When the puff is stitched and gathered, the image printed on the inside becomes almost invisible, and the words written on the fabric become distorted and unreadable. By making the chosen images and words unidentifiable, we make the personal aspects of the puff almost secret and private, so when the puff is added to the whole quilt, it keeps those personal secrets in, while being part of the group piece. I felt this was strongly symbolic of a newly arrived person integrating into a new culture. This is a shortened version of an article due out in Popular Patchwork, May issue, which will include lots more images of the workshops in progress. I love your idea to create a quilt filled with individual and group meaning for so many people. A cool way to use simple fabric manipulation!